An important book on the history of thought but a crucial study in the development of the Austrian School. There is no more comprehensive account available. Alejandro Chafuen is an expert on the Late Scholastics who wrote in the tradition of St.Thomas Aquinas. Joseph Schumpeter called them the first real economists. Writing long before Adam Smith, they wrote on private property, trade, monetary theory and policy, value, price, entrepreneurship, the state, and much more, anticipating insights of the Austrian school yet to come. 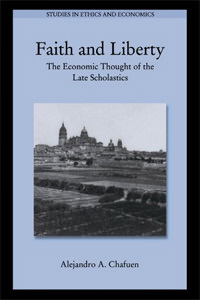 Faith and Liberty is a vastly expanded edition of Chafuen's influential Christians for Freedom. This is an important book for anyone interested in the neglected area of the history of thought, and the development of the Austrian school. "Profits vs Society: Must We Choose?" Woods's book on Catholic social teaching surpasses any other book ever published in this genre. What is morally wrong with the idea of political management of incomes? Murray Rothbard's greatest contribution to the politics of freedom. He was the pioneering French economist who not only anticipated the market thought of the classical school.